MK Dons manager Karl Robinson says Premier League Southampton are the model he wants his club to follow. The sides played each other in League One in 2011, and Saints beat the Dons 6-0 in the League Cup on Wednesday. "They've had multi-millionaire owners and they've rebuilt very well; every manager that's come in has added with quality players," said Robinson. "They've sold players and used the money to bring in better players and sold them on. It's an amazing model." He continued to BBC Three Counties Radio: "These are things we want to learn from and move forward ourselves, but I think we've shown how far behind we are. For me, that's a tremendous learning curve." Robinson's side are playing in the Championship for the first time in the club's history, while Saints, under the ownership of Katharina Liebherr, finished seventh in the Premier League last term. 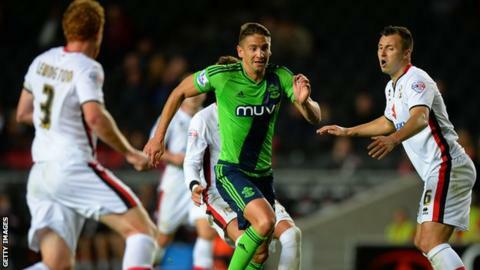 Southampton boss Ronald Koeman made five changes to his side, but England international Jay Rodriguez, Senegal striker Sadio Mane and Republic of Ireland forward Shane Long each scored a brace in the Dons' largest ever competitive loss. "We were beaten by an unbelievable football side," said Robinson. "They want to win the League Cup and they've got all the players to win it. "But my players have learned that the mentality of a Premier League player isn't just what's in his boots, it's what's in his heart and his head too."